Louis Guy Lombardo, age 83, of Estero,Fl, passed away on Wednesday, January 23 at Lee Memorial Healthpark, Fort Myers, FL. Louie, as he was known, was born on October 24, 1935 in Lockport IL. He was preceded in death by his parents, Louis and Anna (Segatto), sister Jean Lutes, son Jeffrey Nels Lombardo and grandson Jimmy Joe Lombardo. He is survived by his wife of 62 years Caroline Ruth (Houdek), three sons, Louis Guy and wife Chris, James Joseph and wife Corrine and Eric Glenn and wife Pam, Daughter in law Kathy Lombardo Walther, 15 grandchildren Sarah, Greg, Andrew, Brad, Starla, Andrew, Matthew, Noah, Jesse, Jonathan, Samantha, Amanda, Zachery, Brian and Danny, 13 Great Grandchildren Griffin, Breck, Blair, Coen, Madison, Joseph, Asher, Gage, Keaton, Delaney, Emily, Bailey and Brenden, two sisters Phyllis Ward and Barbara Meyers and numerous nieces, nephews, cousins, family and friends. Louie served in the Marine Reserve after High School and was later employed at Texaco Oil Refinery in Lockport for 22 years where he was a Foreman. In 1976, he moved to Lake of the Ozarks and used his building trades learned from his father to form Lombardo Construction. In 1990, he relocated to Southwest Florida to work as a construction supervisor, working on several high rise projects before retiring in 2010. Louie was a member of Lamb of God Church since 1992 and served in many capacities. 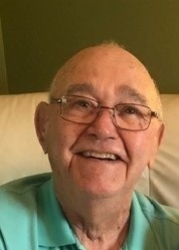 He loved his friends and customers that worked with him at the church’s thrift store where he volunteered up until his passing. He was a member of the Lions International serving as president in Sunrise Beach MO. He served as a Lieutenant in the Lockport Township Volunteer Fire Department. As a lifelong Chicago Cubs fan, his dream of a World Series Championship was finally realized in 2016. A celebration of life service will be Saturday, February 9, 2019 at 1:00 PM at Lamb of God Church, 19691 Cypress View Drive, Fort Myers, FL 33967. In lieu of flowers, the Lombardo family asks that donations be made to Lamb of God Church Memorial Fund. A portion of these gifts will go to support Youth Ministry.